This farm-to-fork concept in Plano feels like a franchise in waiting. In the bandwagon world of nouveau-rustic dining, one of the more damning descriptors a reviewer can ascribe to a restaurant is the word “franchiseable.” The term not only brings a curl to the lip of a certain breed of foodie, but it also puts the restaurant in the position of having to overcome typecasting. Born of a partnership between restaurant veterans Jack Gibbons and Randy DeWitt (Rockfish, Twin Peaks, The Ranch at Las Colinas) and noted Plan B polymaths Royce Ring and Alex Urrunaga (Bolsa, Bolla, La Duni), the venture expands on the regional-sourcing theme by bringing in products from throughout the state as opposed to just the neighborhood, while seeking to inject, as they say, a little Henderson Avenue into Plano. Chef de cuisine T.J. Lengnick (Shinsei) and executive chef John Franke (The Ranch at Las Colinas) are trucking in chicken from Nixon; cheeses from both Deep Ellum and Waco; mushrooms, spinach, and tomatoes from local growers; and herbs from Tassione Farms, just off I-20. Whether this particular farm-to-fork mission will succeed depends, in part, on how much the folks in Plano aspire to be locavores. On all three of our visits, the bar area was, though not packed, pleasantly populated with a nonhipster crowd, and the dining room spilled over with a mix of the early-bird set and moderately heeled thirtysomethings. Did those people care that their mushrooms were local? My suspicion is that the food will need to be strong enough to stand on its own merits. Warehouse-high ceilings, exposed beams, napkin rings fashioned from pipe fittings, and tattily upholstered conversation seating scattered throughout create the illusion of back-room coziness. The aesthetic, no matter how contrived, can’t help but appeal on a gritty, no-nonsense level. Our group spent a great deal of time scrutinizing the rusty, retrofitted work light illuminating our booth and the bare-bones, copper-pipe faucets in the bathroom, not because they were insufficient but because we were desperate to figure out how to replicate the look. Score one for Plan B and their unapologetic use of the C-clamp. On the plus side—and it must be stated that the bulk of our visit fell in this territory—I have seldom been so consistently pleased with a restaurant’s service ethos. Uniformly clad in white t-shirts and jeans, with the exception of cloth aprons for the women and suede tool belts and suspenders for the gents, the servers feel fresh faced and forthcoming, as if service-industry jadedness is still years beyond them. On our first visit, Bishop, our cool-yet-engaging server, was as quick with suggestions as he was with maintaining a distance. When our second course arrived while we were still enjoying the first, rather than make room on the table, he ferried it back to the kitchen without a word and had it remade when we were ready. On our third visit, our server Ashley was so relaxed and unscripted—joining in easy banter but knowing when it was time to buzz off—that we vowed to request her again on future visits. Though we can overlook the fact that the whiskeys, bourbons, and Scotches are referred to uniformly as “browns,” we can’t overlook the fact that Whiskey Cake’s hand-crafted drinks tend to fall flat, most notably the French 75, a mixture of champagne, gin, lemon juice, and simple syrup that my date compared to an uninspired mix of gin and ginger ale. The exception, the Secretariat margarita, pleased with its blend of horseradish-infused tequila, Cointreau, lime, pineapple, and simple syrup, and the house-cured beef jerky garnish added a surprising and thoroughly enjoyable kicker. Additionally, drinks served on the rocks benefit from Whiskey Cake’s thrice-frozen ice, a process that purges impurities and results in slower-melting cubes. Scotch drinks are served with a pressure-formed ice ball. In light of this special preparation, drinks ordered on the rocks (or neat) will run you $2 more for both the ice labor and the more generous pour. The enthusiasm with which Whiskey Cake embraces Dallas’ finest—specifically Meaders and Robert Ozarow’s Empire Baking Company and Paula Lambert’s Mozzarella Company—speaks volumes about the ownership’s history with this market. On the meat and cheese board, Lambert’s plain mozzarella and Deep Ellum blue cheese offer a creaminess and freshness that can’t be found in nonartisan cheeses. The balance of the board’s regional fermentables came from Waco-based Homestead Gristmill and the Texas Cheesemakers from Cleveland, Texas. House-marinated olives, wildly bright coarse-grain mustard, roasted red peppers, and cured meats round out the selection. The true standout was a dense andouille sausage, smoked in-house and oven roasted, that soared thanks to a combination of peppery spice and animal fat. No doubt Whiskey Cake will come to be known for its Three Little Pigs—a trio of enormous pulled pork sliders topped with Napa slaw and fried onions and served teetering on a warm brick. The sandwiches score top marks on all levels, from meat tenderness to juiciness to flavor balance, and when accompanied by a ramekin of tremendously addictive thick-cut, house-pickled cucumbers, the dish is winning enough to inspire midnight cravings. Likewise, the Texas blue crab cake with slaw became a table favorite, disappearing all too quickly. The $10 price point on the Three Little Pigs felt reasonable verging on generous. So, too, the $5 plate of batter-fried green tomatoes (simple, satisfying, and less greasy than the traditional cornmeal preparation) felt like a steal. But the $12 crab cake felt like a bit of a rip. Heated negotiation went into the ordering of the deviled eggs. Turns out, hard-boiled eggs—especially the deviled kind—inspire passionate feelings on both sides of the culinary fence. The majority won, and our tester was banished to the bar area to eat his half-order of the stinky things. After all that, the eggs didn’t live up to the hoopla. The filling, he reported, was dominated by a mustard heavy enough to drown out all other flavors. The accompaniments—salmon, capers, and onions—were sparse enough as to be insignificant. Whiskey Cake’s menu is most obviously polarized in the entrée department. Across the board, the burgers, stacks, and melts outshone their descriptions, while the main plates were almost uniformly mediocre and, on one count, disastrous. The only exception to the rule was the spit-roasted Holmes Farm bird served over sweet potato-fennel hash, which ran with juices, even from the usually dry breast. Before we enter the league of exceptional sandwiches, let’s pause for a shout-out to pickling skills. From half-inch-thick pickle rounds to thinly sliced onion, the vinegary flavors zip, zing, and pop like a Marvel comic showdown. Playing to this strength, the chefs have incorporated pickled veggies into the majority of the sandwiches and entrées. One place where they don’t show up (and don’t really need to) is on the architecturally magnificent OMG burger. It is no small thing when I say that this is, by far, the best burger I have ever tasted. Chefs Lengnick and Franke hit this one out of the park by topping a dirigible of brisket beef with a giant onion ring and filling the divot with sautéed criminis. Port Salut cheese, chili mayo, and an almost horseradishy grain mustard eliminate the need for anything as pedestrian as ketchup. Equally impressive, the BBQ bánh mi sandwich—wood-smoked pulled pork served on a torpedo-like Empire Baking Company roll and topped with pickled onion, cabbage, carrot, arugula, and cilantro—is so overstuffed that the server had to instruct us on how to eat it without making a mess. And the special pressed pork sandwich’s buttery outer crust and stacked slabs of roasted pork left us pining for one to take home. Finally, touted as being like Thanksgiving in your mouth, the smoked turkey stack made a sandwich-lover out of our harshest critic. Served on Empire’s hippy healthy bread, it was piled high with actual thick-cut, house-smoked turkey, Muenster cheese, slaw, and cranberry chutney. The secret behind the meat: Whiskey Cake brines, smokes, and roasts four whole turkeys and more than 50 pounds of pork in-house every single day, so the meat goes from bone to bread with very little downtime. Next to the wow factor of the burger and bánh mi, the short ribs and the pork chop felt, while not unpleasant, certainly unremarkable, and the mesquite-grilled redfish over orzo and spinach had potential but was ultimately too salty. The buzzard on the menu was the mesquite-grilled, sirloin cap steak. The meat was astonishingly tough—so much so that all four of us discharged our bites into our napkins. Do not skip the restaurant’s namesake dessert. The eating of it—a sticky toffee cake with dates and in-house spiced pecans wading in a pool of crème anglaise and topped with house-made whipped cream—may, however, result in a war of the spoons. Be the voice of reason and order two. 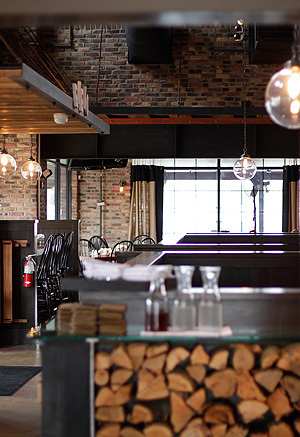 For more information about Whiskey Cake, visit our restaurant directory.